JP 2007-04-10 600 points ? US 2007-04-16 600 points ? EU 2007-04-13 600 points ? 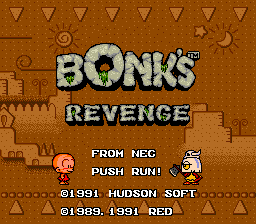 Bonk's Revenge, known as PC Genjin 2 (PC原人2) in Japan. Program: Ken.H, いたみ よしひろ, Takashi O. Main article: Bonk's Revenge/Magazine articles.